This domain is found in the extracellular portion of receptor-like proteins - such as serine/threonine kinases and adenylyl cyclases (PUBMED:11590000), (PUBMED:11590001). Predicted to be a ligand binding domain (PUBMED:11590000). The CHASE domain is an extracellular domain of 200-230 amino acids, which is found in transmembrane receptors from bacteria, lower eukaryotes and plants. It has been named CHASE (Cyclases/Histidine kinases Associated Sensory Extracellular) because of its presence in diverse receptor-like proteins with histidine kinase and nucleotide cyclase domains. The CHASE domain always occurs N-terminally in extracellular or periplasmic locations, followed by an intracellular tail housing diverse enzymatic signalling domains such as histidine kinase (IPR005467), adenyl cyclase, GGDEF-type nucleotide cyclase and EAL-type phosphodiesterase domains, as well as non-enzymatic domains such PAS (IPR000014), GAF (IPR003018), phosphohistidine and response regulatory domains. The CHASE domain is predicted to bind diverse low molecular weight ligands, such as the cytokinin-like adenine derivatives or peptides, and mediate signal transduction through the respective receptors [(PUBMED:11590001), (PUBMED:11590000)]. The CHASE domain has a predicted alpha+beta fold, with two extended alpha helices on both boundaries and two central alpha helices separated by beta sheets. The termini are less conserved compared with the central part of the domain, which shows strongly conserved motifs. There are 9481 CHASE domains in 9473 proteins in SMART's nrdb database. Taxonomic distribution of proteins containing CHASE domain. This tree includes only several representative species. The complete taxonomic breakdown of all proteins with CHASE domain is also avaliable. Click on the protein counts, or double click on taxonomic names to display all proteins containing CHASE domain in the selected taxonomic class. 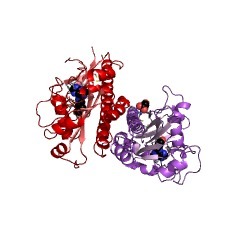 The CHASE domain: a predicted ligand-binding module in plant cytokininreceptors and other eukaryotic and bacterial receptors. A novel, 200-230 amino acid extracellular domain was identified in theplant cytokinin receptor Cre1, in the receptor-histidine kinase DhkA andthe adenylyl cyclase Acg from the slime mold Dictyostelium discoideum, andin a variety of other receptor-like proteins from bacteria and eukaryotes.The domain is predicted to bind diverse low molecular weight ligands, suchas the cytokinin-like adenine derivatives or peptides, and mediate signaltransduction through the respective receptors. CHASE: an extracellular sensing domain common to transmembrane receptorsfrom prokaryotes, lower eukaryotes and plants. A novel extracellular ligand-binding domain, termed CHASE, is described insensory adenylyl and diguanylate cyclases, and histidine kinases, inseveral bacterial species, Dictyostelium and plants. The CHASE domain ispredicted to sense stimuli that are specific for the developmental programof an organism.